Glossy petals of orange, scarlet, and deep red are dazzling against the upright blue green filigree foliage. The flowers are large, 3” across, and bloom early summer to fall where summer temps are moderate. Deadhead for continued bloom. We have always wanted to grow enough cockscomb to craft a brilliant seasonal wreath and now we can! 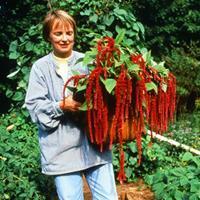 Tall growing 'Tornado Red' is a vigorous, large flowered variety that holds its color well once dried. Not fussy in the least, just provide fertile, well-drained soil in sun. Redhead was awarded Best Coleus at the Cornell floral trials, for good reason, as it is a strong grower, uniform, with a unique rich color, absolutely glowing.